Just recently, a prologue trailer for Warioware Gold released in Japan. Well, Nintendo are now officially ready to embrace the wacky world of Wario and unleash it upon the world with a Demo. The Warioware Gold Demo is now available in the 3DS eShop so if you are on the fence about buying the full game when it releases on July 27th, you should definitely give the demo a go. You can find out more about Warioware Gold via the official Press Release below. 5th July, 2018 – Wario is up to his old tricks again in WarioWare Gold which releases exclusively for Nintendo 3DS family systems on 27th July. Press buttons, tilt the system, use the Touch Screen and blow into the microphone through 300 wacky microgames in the biggest WarioWare game yet, featuring a mix of series’ classics as well as some brand new, quick-fire challenges. 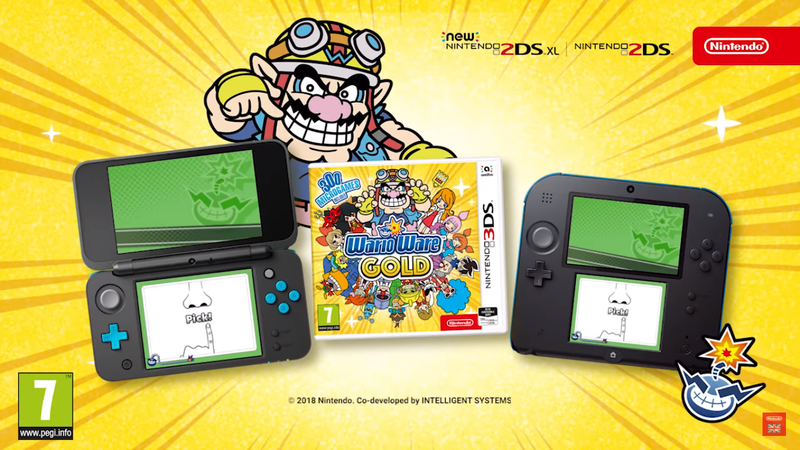 Try out some of Wario’s favourite microgames today by downloading the demo directly from the WarioWare Gold website or from Nintendo eShop, and watch the WarioWare Gold – Demo Trailer on the official Nintendo YouTube channel. WarioWare Gold introduces an all-new, fully-voiced story* featuring Wario at his mischievous best, as well as an all-star cast of zany characters. After a long day of treasure hunting in Luxeville – and discovering a precious artefact along the way – Wario heads home to play video games and eat food, only to discover he’s all out of money! Watching a news report about a best-selling video game, Wario decides to cash in on the opportunity and persuades some old pals to create games for him so he can host the lucrative Wario Bowl games at the Diamond City Stadium. Players must battle through the different leagues of the Wario Bowl games by completing a series of quickfire microgames – each unique to their creator – before going to battle with the final boss. Each set of microgames gifts players with just four chances, but if they run out they can keep going if they’re prepared to cough up some in-game coins. Whether it’s Jimmy T with his slick dance moves, Mona’s high sense of fashion or 9-Volt and 5 Volt’s selection of retro classics, players will need to think quick and react sharpish if they want to walk away with the Wario Cup and coins galore. Meanwhile, who is this mysterious girl trying to get to Wario and what is she up to? Battle Time: Up to 2 friends can compete against each other and test their WarioWare skills by connecting over a local wireless connection** and taking on the same microgames simultaneously. Each player gets 4 tries and the last player standing is the winner. For players who are new to the WarioWare series or can’t handle the heat, there’s the option to adjust the number of tries for each player between 1 and 4. Mash, touch, twist and blow through over 300 microgames when WarioWare Gold releases exclusively for Nintendo 3DS family systems on 27th July. Download the demo from Nintendo eShop today.